"This is a recipe for cookies that my grandma used to make when I was a child. They are very light cookies." In a large bowl, cream together butter and sugar until smooth. Stir in the heavy cream and beaten eggs. Mix the ammonia into the boiling water and stir to dissolve; stir into the butter mixture along with the peppermint oil. Combine the flour and baking powder; stir into the batter until evenly blended. 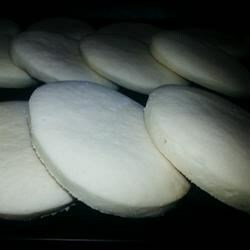 On a lightly floured surface, roll the dough out to 1/4 inch in thickness. Cut into desired shapes with cookie cutters. Place cookies 1 1/2 inches apart onto the prepared cookie sheets. Bake for 10 to 12 minutes in the preheated oven, until edges are golden. Cool slightly on baking sheets before removing to wire racks to cool completely.